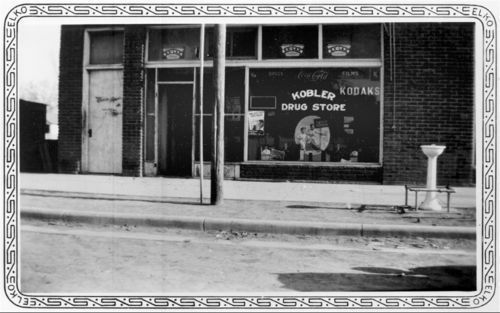 This photograph shows an exterior view of Kobler Drug Store in Morland, Kansas. Besides the main sign for the store's name, the other signs in the window include advertisements for Ex-Lax, Coca-Cola, films, and Kodaks. The border around the picture has the name "ELKO" at the corners. Holding Institution: Graham County Historical Society, 1974.